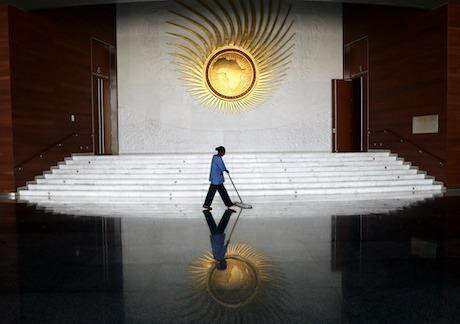 A janitor cleans the entrance hall to the new conference centre of the African Union in Addis Ababa, Ethiopia. Picture by Wolfgang Kumm DPA/PA Images. All rights reserved. While Morocco’s admission to the African Union (AU) last month should not make any tangible difference on the forty-year long Western Sahara conflict in the short term, it could however eventually trigger a new dynamic for a lasting solution. The fact that the two North African foes, Morocco and the Sahrawi Arab Democratic Republic (SADR), are sitting next to one another in the AU’s premises, might make the union a better place juridically and politically to find a way to reconcile under the auspice of the United Nation (UN). In order to do so, a genuine and sincere position must be the sine qua non condition. However, in the current situation, it clearly appears that Morocco does not intend to depart from its initial position of preventing the organization of a referendum as stipulated in the UN’s charter. Moreover, while last year, many analysts were surprised by Morocco’s demand to join the AU, it is important to understand that Rabat’s position vis à vis the last colony in Africa, has not changed since its withdrawal from the Organization of the African Union (OAU) in 1984. So why did Morocco decide to eventually join the AU? It is paramount to understand that behind the curtains of a seemingly ongoing democratic process in Morocco - the country is often presented as a model for the region and even the wider Arab world - the King, Mohamed VI is in reality the sole holder of all strategic decisions concerning his country. More importantly, if Morocco is in theory a constitutional monarchy, in practice, it is more of a royal and political despotic system. For instance, it must be noted that the foreign affairs portfolio is under his unique control. Moreover, Mohamed VI’s legitimacy is largely founded on religious grounds, presenting himself as Commander of the Faithful, meaning that he is from the Prophet Mohamed’s direct lineage. The king is the first entrepreneur and the only one who decides in Morocco. Economically, despite some tangible results and success stories at the continental scale, such as the Attijariwafa Bank numerous investments in West Africa and in Tunisia for instance, Moroccans continue to suffer from high unemployment and inequalities. According to the 2015 United Nations Development Programme (PNUD) report, Morocco was ranked 126, that is in the medium human development category. As a regional comparison, Libya and Tunisia are ranked 94 and 96 respectively while Algeria is ranked 83. This rather poor economic situation has been further deepened by the current economic crises hitting the European Union (EU) and primarily France and Spain, the main economic partners of the Moroccan Kingdom. Western Sahara is also a gateway to sub-Saharan Africa where Morocco has been actively present in the past few years. Furthermore, bearing in mind this socio-economic situation, it is not a surprise that for Rabat, the Western Sahara is a crucial territory as it provides Morocco with an important yearly revenue extracted mainly from the phosphate and fishing industries. Currently, the fishing industry officially provides jobs to more than 70 000 people, accounting for 17% of the GDP of the Western Sahara territory. As for phosphates, this accounts for 20% of Morocco’s annual budget. Also, 10% of Morocco’s total exploration, equivalent to 6% of Morocco’s GDP in 2012 was extracted from Western Sahara soil by the national Moroccan company, the Office Chérifien des Phosphates (OCP). The OCP’s ambitions are to double its production by 2020, which would further create a de facto economic dependency on the Western Sahara’s phosphates. Western Sahara is also a gateway to sub-Saharan Africa where Morocco has been actively present in the past few years. Yet, the December 2016 Court of Justice of the European Union (CJEU) ruling stipulating that any economic agreement between Morocco and the EU does not include the Western Sahara territory is a serious blow for the Makhzen, or the central state. For the CJEU, the agreement between the European Union and the Kingdom of Morocco “must be interpreted, in accordance with the relevant rules of international law applicable to relations between the European Union and the Kingdom of Morocco, meaning that it does not apply to the territory of Western Sahara”, underlining henceforth that neither Morocco nor the European Union (EU) have the right to exploit the resources of Western Sahara. Politically, Morocco’s annexation of Western Sahara has complicated the former’s foreign affairs to the extent that Moroccan diplomats see, perceive and analyse the world and international relations solely through the Western Sahara prism. Rabat can nonetheless rely on France, its main ally on this thorny conflict. Indeed, as a key-regional partner but also due to strong historical ties, France has always helped Morocco military and economically. For instance, Paris has always blocked any UN resolution that would go against the interests of Rabat, such as the 2013 UN human rights text condemning Morocco’s violation of human rights in Western Sahara. In Sub-Saharan Africa, Morocco has been pursuing an aggressive and rather successful political and economic policy by investing massively and striking different economic deals encompassing the banking, phosphate and services sectors in numerous countries, especially in West Africa. This economic strategy is intended not only to strengthen the economic ties between Rabat and its neighbours but also to rally them under the Moroccan cause over Western Sahara. This also explains why Morocco and its supporters were disappointed when their ally, the Senegalese Abdoulaye Bathily, was not elected as Chairperson of the AU. Morocco’s presence within the AU is very unlikely to go smoothly and will now be facing a new battle from within. In this politico-economic strategy, Morocco has even convinced Nigeria - a strong supporter of Western Sahara - to build an oil pipeline from Nigeria to Europe crossing Western Sahara and Morocco. This could also well be intended to counterweigh the New Partnership for Africa’s Development (NEPAD) conducted by three staunch advocates of Western Sahara’s self-determination: Algeria, Nigeria and South Africa, who also happen to be among the ‘big five’ of the AU. Prospects for a solution to the Western Sahara conflict? Following more than thirty years of the rather unsuccessful politics of the empty chair at the AU, Rabat has decided to eventually join the AU to work and lobby from within. Morocco’s decision has been preceded by pragmatic and strategic economic policies or soft-power. Yet, Morocco’s presence within the AU is very unlikely to go smoothly and will now be facing a new battle from within. No doubt that the question of self-determination and referendum, the issue of human rights and the question of natural resources will always be reminded to Rabat and its African allies. As a result, there might be some hope that under tremendous pressure, Morocco will be obliged to eventually sit and genuinely talk to the SADR and its political representatives, the Polisario Front, to find a lasting solution. On the other hand, if Morocco’s intentions are to divide and eventually make the AU fall apart, it will definitely find great resistance in front of it, even among its current allies who are all too aware of the importance of the AU for Africa and Africans despite its imperfections and shortcomings. Having said that and no matter its real intentions, Morocco is now accountable to the AU and its member states. And the Kingdom will now have no choice but to engage in peaceful and constructive negotiations with the SADR to put an end to the last colony in Africa.